Happy Wednesday Everyone! 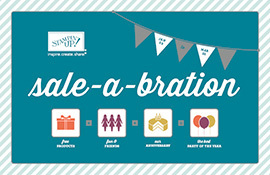 If you don't know it yet, Sale A Bration has begun! Not familiar with this wonderful time of the year? Well, Stampin' Up gives you the opportunity to earn FREE products by either placing a $50.00 order, hosting a qualifying workshop, or joining the Stampin' Up Family. This year's offering includes exclusive stamp sets and accessories, as well as a selection of catalog stamp sets, digital content CDs, ribbon, buttons, and even an embossing folder! Now, more than ever, there's something for everyone! It doesn't get any better than that. If you do not have a Sale A Bration Mini Catalog, you can request one from me or download it from my right sidebar to view it instantly. Additionally, Sale-A-Bration + Stampin' Up! 's 25th anniversary = the best time to host a Stampin' Up! party! How cool is that? To start earning your FREE Sale A Bration Products,click here!